CEED’s Chief Investigators at O’Reilly’s Rainforest Retreat (Lamington National Park, Qld). 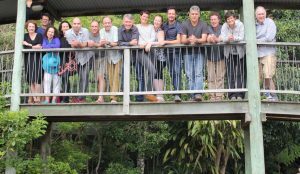 Earlier this year CEED’s Chief Investigators came together at O’Reilly’s Rainforest Retreat (Lamington National Park, Qld, CIs are pictured) to reflect on CEED’s impact on the world of environmental decision science and to plan a ‘book of lessons’ emerging out of our research. CEED didn’t invent decision science but, through its research and tool development, it has played a pivotal role in placing environmental decision science at the centre of good conservation management and policy. The CEED Book (the working title of this book of lessons) will emerge over the coming year. It will include chapters on conservation planning, adaptive management, structured decision making, value-of-information analysis, triage, cost effectiveness and much more besides. Each chapter will present a bite-sized overview of the topic, discuss how CEED science has extended the field and serve up case studies demonstrating the value of good environmental decision-making. Each chapter will also provide content feeding into a range of other communication outputs such as policy briefs, short videos and, down the line, an online environmental decision science course. 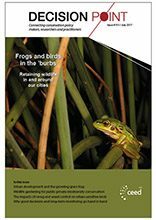 You can also see elements of each chapter in a new series of Decision Point articles on the basics of good environmental decision making. That series kicks off in this issue of Decision Point with David Lindenmayer presenting the case for long-term ecological research providing an evidentiary base for good management and policy – more important than ever in a ‘post-truth’ world. So, what is the key to good environmental decision making? Having been a privileged observer of the science being developed by CEED over the past decade (as the Editor of Decision Point), I have to say that my answer to this has changed. Here is my take on environmental decision science 101. As a younger man I believed a good environmental decision was one that generated a good outcome (saved a species over here, protected valuable habitat over there). While I still think a good outcome is important, it is possibly secondary to the process by which it is generated. A good decision for the environment is one that is transparent, efficient and effective; that came about with real stakeholder engagement and support; one that enables learning; and something that serves as a stepping stone to even better decisions down the line. How is this achieved? Read the book and find out (and continue to read Decision Point).